When I started this exploration of the foods of recently maligned countries a few weeks ago, the only real familiarity I had with African foods were those from Ethiopia. When I first moved to Chicago, there were three Ethiopian restaurants within walking distance of my apartment. I’d go frequently on the weekends when they had a cheap and plentiful buffet and load up on all sorts of delicious things – the spongy sour bread that sops up all the delicious flavors, the deeply flavored, subtly spicy stews and the tender, flavorful greens. Oh man, those greens. Right off the bat, I knew I had to make those greens. I did a little research to find out what was up with those greens. What were those flavors? How were they so silky? I’d made collards many times but never like this. I perused many recipes, noticing a lot of commonalities – a spiced butter, a long stew to make them tender – and landed on a favorite resource of late, Saveur. Again. I really hope this magazine makes it through this tough time and sticks around. It is such a great resource and full of interesting articles. If you’re not currently a subscriber and love food, consider supporting this amazing magazine (just $10 for a year!). The recipe starts with what might be some unusual and exotic spices to many – black cardamom seeds, fenugreek and nigella seeds (also known as kalonji). You surely have those, right? Funny enough, I did, leftover from an Indian project I worked on not long ago. If you don’t, they’ll take a little bit of effort as they’re not the kind of things you’ll find at your corner American grocery store unless you live in a really cool neighborhood. But who isn’t up for an adventure? A trip to an Indian grocery store, while a little intimidating for a first timer, will set you up and be highly interesting at the same time. The downside is you may end up with more than you need or want, though always at a good price. The next option is to visit a spice shop. My local spice shop, The Spice House, is one of my favorite places and they have a great online store too. Their spices are affordable, always fresh and come in manageable quantities. I realize this may all seem like a lot of effort for such nuanced flavors but I do encourage you to seek these out. I don’t think you can skip it. So once you’ve had a grand adventure and the spices have been procured, they’re sautéed ever so gently in butter (or ghee) to release some flavor. Then olive oil is added to the pan along with an onion. I tend to use a light hand with the oil when sautéing; this is a mistake I’ve learned. Here, a large onion is sautéed in nearly ½ cup of butter/oil and it is glorious. With the spices, I’m convinced this is what makes the greens so special and luscious. To add even more flavor, ginger, chilies and garlic are added to the mix then the stemmed collards, cut into wide ribbons. Then a long stew time – just short of an hour – to cook the greens slowly and break down any tough fibers. 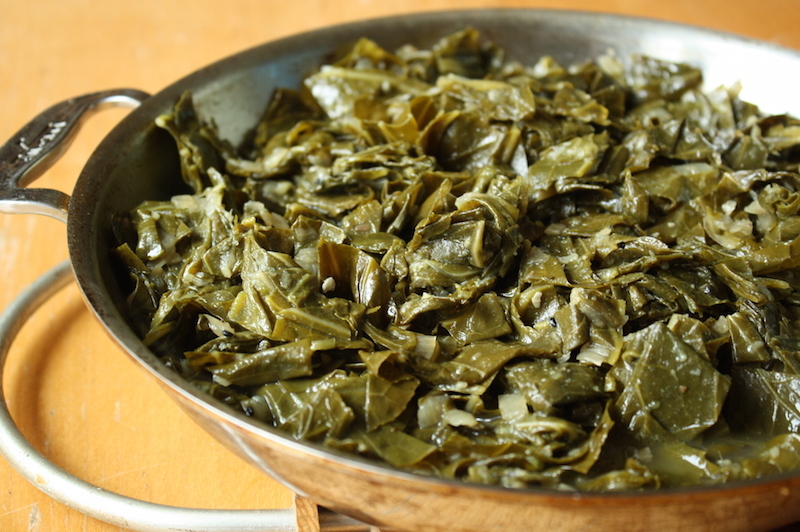 What emerges from the pot are greens with great flavor and an amazing texture – so silky and flavorful. A little bit of vinegar is added to brighten everything and I’m right there with a fork, not even bothering to get a bowl. STRESS THERAPY BAKING FACTOR: SILK AND SPICE. I love this dish and now that I have all these leftover spices I’m not too sure what else to do with, I’ll be making these often. A large bowl with maybe a little leftover rice to soak up the juices (pot likker in many parts) is heavenly. I love greens of all sorts – collards, kale, turnip, mustard, chard – and these flavors and yes, the added fat, make them wonderful. I hear they’re good for you too. Maybe not the ½ cup of butter/oil but whatever. Reminder! Call you representation and make your voices heard regarding immigration. Call the Capital switchboard (202) 224-3121 and they can connect you to your Senator or House representative. Call early and call often! See the notes on the spices in the text above. Also fresh greens are very bulky but cook down by 2/3 in volume. Start with a big pot but if you can’t fit them all in, wait a few minutes until they start to break down and pack in the rest, stirring carefully. 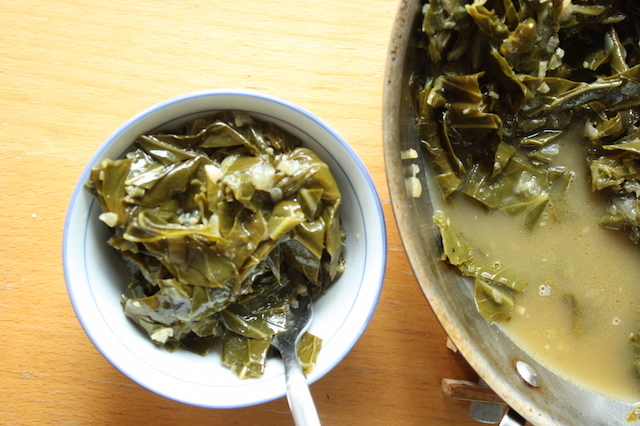 Wash the collards well by submerging into a large bowl or sink full of water. Drain well. Remove and discard the stems and cut the leaves into ¼” ribbons. Add cardamom, fenugreek, and nigella seeds and cook, stirring often, until fragrant, 1-2 minutes. Increase heat to medium-high and add the oil. Add the onions and cook, stirring often, until lightly browned, about 10 minutes. Add the garlic, chiles, and ginger and cook, stirring often, until soft and fragrant, 1-2 minutes. Add the collards, water, and salt and pepper; bring to a boil and cover. 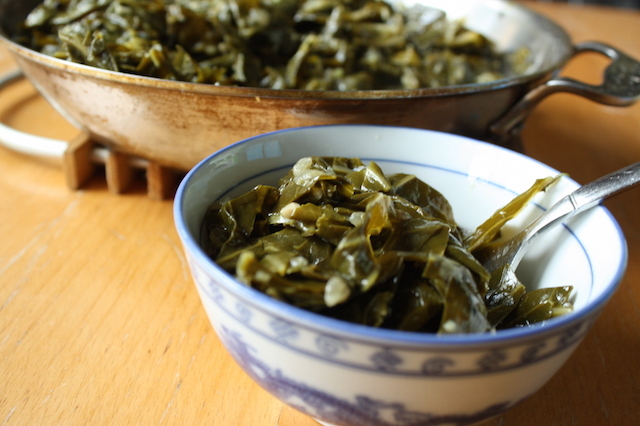 Reduce the heat to low and cook covered, stirring occasionally, until collards are tender, 50-55 minutes. Stir in the vinegar, taste and adjust seasoning if need. Serve hot with hot sauce on the side if desired. Never a bad time for collards. I’ve never known there is a black cardamom. So it’s smoked. There are some brewers using cardamom, and a smoked version might be a really nice addition to a dark beer. I’ll have to try this.